Disabled Minor League Hockey Player. Played Enforcer Role 15 years. Been diagnosed Traumatic Brain Injury, Dystonia, Parkinson's, Major Depressive Disorder, Anxiety from Chronic Pain. Been told by Nuerology probable Chronic Traumatic Encepalopathy CTE. All brought on to me from Commercialized Violence Involving My Youth....Starting with my Major Junior Hockey Club and current 2016 Memorial Cup Champions The London Knights. I was invited to The St Louis Blues Training Camp at 19 years old. I am currenty 12th All-Time Season Penalty Minute Leaders with The London Knights since 1960. I have been involved in Treatments for my Injuries at The Hospital Level for 5 years. 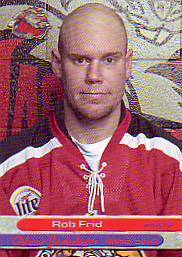 I retired from Minor Professional Hockey in 2004-05 with The Rockford Icehogs current Minor League team for The Chicago Blackhawks of The National Hockey League. A Story was written about me in Febuary 2016 in our Canadian National Newspaper called "One Last Fight" by NHL Sports Writer James Mirtle for the Globe and Mail. http://www.theglobeandmail.com/sports/robert-frid-enforcer-fighter-stuggles-with-concussions-hockey/article28929084/? I continue too be a Voice and addvocate for the immediate removal of "Fighting" out of Major Junior Hockey. I am a active member of Ex Toronto Maple Leaf Enforcer Kurt Walker's Non-Fro Profit Foundation "Dignity After Hockey" out of Boston MA. I am on the Executive Canadian Board based out of Toronto Ontario, Canada I also Support Ex NHL Flyer Enforcer Riley Cote and his Foundation called Hemp Heals. I Support and Advocate the use Medicinal Cannabis and the use of CBD Oil among active players in Professional Hockey. I also support CW Botanicals out of Colorado Springs Colorado with produces the CBD Oil Strain "Charlottes Web" in which is a Hemp Supplement and is legal in all 50 States. It is a proven Neuro Protector and Inflammation Blocker, which in turn we feel is The New Sports Medicine Science believes. I also support The Realm of Caring a Educational Foundation teaching the Healthy Lifestyle and why Cannabis is Amazing and used for so many Medical conditions and working well with Several Contact Sport Athletes.